Heat oil in a pot placed over high heat. Whisk together flour, baking soda, salt and water. Dip vegetables in batter and fry in batches. You’ll know the oil is hot enough when you insert a wooden spoon and little bubbles form around it. Place vegetable pieces on a paper towel to drain excess oil. 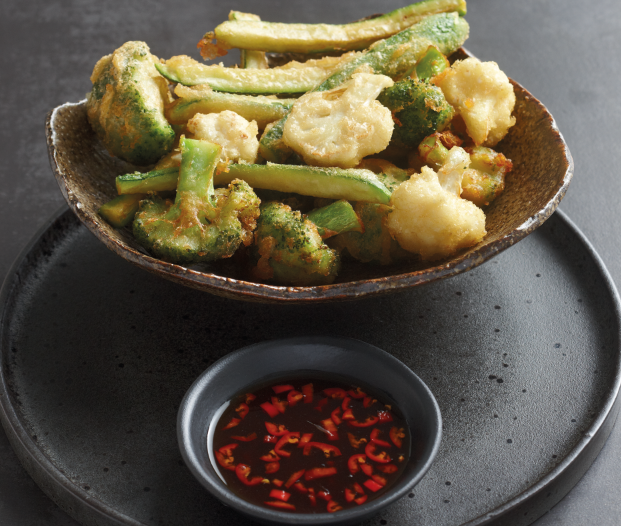 Combine all dipping sauce ingredients together in a bowl and serve with the tempura. *Add one cup sparkling water to the mixture first. If it’s too thick, add more until the batter is like pancake consistency. *To test whether the oil is hot enough, insert a wooden spoon and if lots of tiny bubbles appear around the spoon, the oil is ready.